A few weekends ago, the 20/30s Group at church met up and we were hosting the dessert part of a Progressive Dinner for InterVarsity, a christian group for college students. I found a 2 ingredient cake on Pinterest. I'm a huge fan of easy, so I figured it was worth a shot. Additionally, I had to make this cake on Friday evening after work, so I needed something easy and quick. Icing ingredients.. The container = powdered sugar. Set the oven to 350°. Mix the pumpkin and cake mix together. That's it. No eggs, no oil, no water. Just the pumpkin and cake mix. 2 ingredients. For realz. Yeah. Oil/spray your baking dish (I used 9x13, but the original post did cupcakes, but I needed this cake to serve at least 30 people so cake it was) so the cake doesn't stick. After batter is mixed, put it in the baking dish and smooth out as well as possible. The cake shouldn't be lumpy, but it wasn't super easy to spread, so I wasn't too concerned over perfection. I cooked my cake for 35ish minutes and I live at the beach, so if you're higher altitude, do your own adjustments. Ya know, like with a regular cake. Mix all ingredients together. You may want to add powdered sugar a cup at a time so you don't end up with a huge cloud of powdered sugar all over your counter (not that I've ever done that before.. pffth). No real special directions here. Mix and blend until the icing is creamy. If the icing feels.. granulated (for lack of better words), keep mixing, your sugar isn't melted enough... Teh Sister taught me that with the buttercream icing. Damn, Bets does good work! Once the cake is cooled (yes, this is actually important), spread the icing over the cake. If the cake isn't cool, the icing will because melt-y and more like a glaze... and it will all run to the edges since the middle will probably be higher than the sides. I was in a hurry, it couldn't be helped. There was no cake left at the end of the night. It was devoured. I got compliments on it ALL night long. This is how pumpkin spice cake should look. Since it was so easy, after dinner this past Friday night, a few girls came over and we were going to watch What to Expect (don't waste your money, seriously). We were also in the mood for some dessert. I had picked up all the ingredients for pumpkin spice cake when I'd went to Walmart with Teh Humanitarian the evening before. 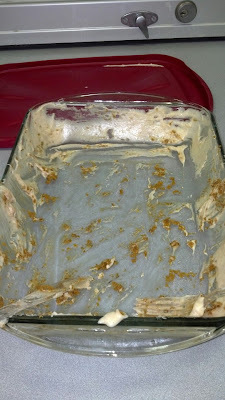 So I, easily and quickly, whipped up the cake while they were changing into warmer clothes, wimps. I didn't have all the icing ingredients, but luckily I still had some extra icing from the prior weekend. Before the cake was cooled, I spread the icing on (which was only ok, since I needed the icing to thin out so it would go further. 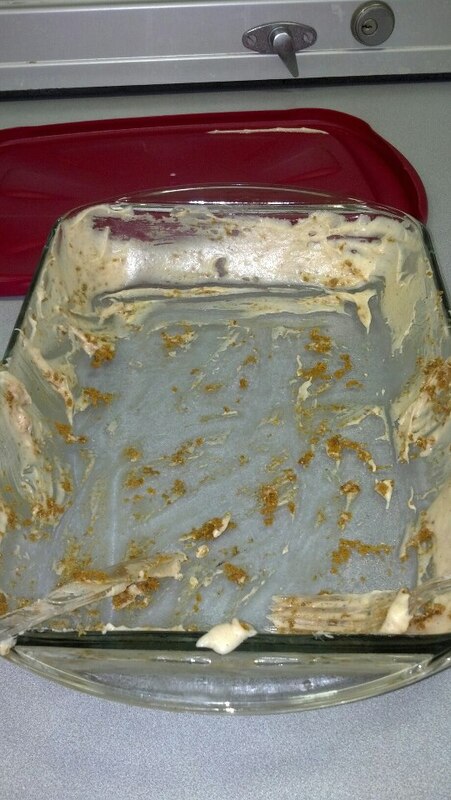 The little bit I had left covered almost the entire 9x13 cake. WIN!). Since I remade the cake, I was able to get a photo of it this time around! Don't you mean Happy November?? lol And yes, that cake is good! 1) The cake looks yummy! Wow that is easily the easiest cake recipe I've ever seen. Anyways I'm stopping by via Delightfully awkward brittany as we've both been nominated for a blog award and I thought I'd check everyone else out! Love your sense of humour! Wow! What an easy cake.